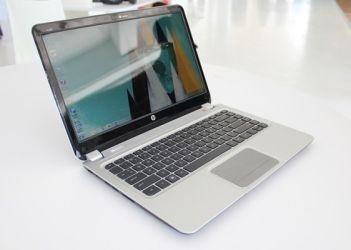 "Expanding its lineup of ultra-thin ultraportables, HP announced a new line of 14 and 15.6-inch notebooks that are less than 0.8 inches thick, weigh about 4 pounds, and start at $599. Since not all of configurations will meet Intel’s requirements for the “Ultrabook” moniker, those that don’t will be called Sleekbooks." Thin is in! Extremely thin and portable laptops are not a new thing, but the designs are getting better, and they are showing fewer compromises. What I like is that the prices are starting to come down even further, reaching into the mainstream laptop range. Decades ago, getting a laptop that was 4 pounds or under cost you the mortgage on your home, several body parts, your first born and that piece of cake you were saving in the refrigerator. $599 sounds like a much better price, meaning that more people can get access to better hardware!